I wasn’t sure what to expect when I first attended the Alzheimer’s Show last year. Having been made aware of the event through a colleague of mine, I wondered how much value I might be able to get out of it, if anything. Like most people, I’d obviously heard about the disease and had paid some attention to the various TV shows and news reports about the ‘looming crisis’ in dementia care for older people. I wouldn’t exactly put myself in the category of the ‘worried well’, but certainly I had concerns. My interest in attending was increased after my father’s Alzheimer’s diagnosis. He was in his early 70s, so it wasn’t completely ‘out of the blue’, but it was still a shock nonetheless. As a result, I was determined to find out more about the disease and see what I could be doing in order to help out. As well as this, of course, ever present in those early stages was the fear of eventually not being recognised by someone you’ve known your whole life – which is certainly quite a powerful negative thought to try and deal with. So I was hoping to find some kind of reassurance through learning more about the situation. My mother was swiftly identified as my father’s primary carer. Something I’ve subsequently found out is a very common occurrence – with the diagnosed person’s partner generally becoming their carer. So I was obviously also keen to try and assist her in any way possible. On reviewing the speakers and participants at the Show, I felt at the very least I’d be able to gather more info that might be useful for us at some point in the future. On the first day of the Show, having made my way to Olympia, I was initially surprised by the buzz that I detected coming from the exhibition hall. On walking in, I saw there was a large array of exhibition stands and seminar rooms, with lots of people either walking around or discussing things with the people on the stands. In the back of my mind, I had probably been anticipating something akin to a school summer fete, so the obviously-engaged nature of all the exhibitors and attendees I could see came as something of a surprise. 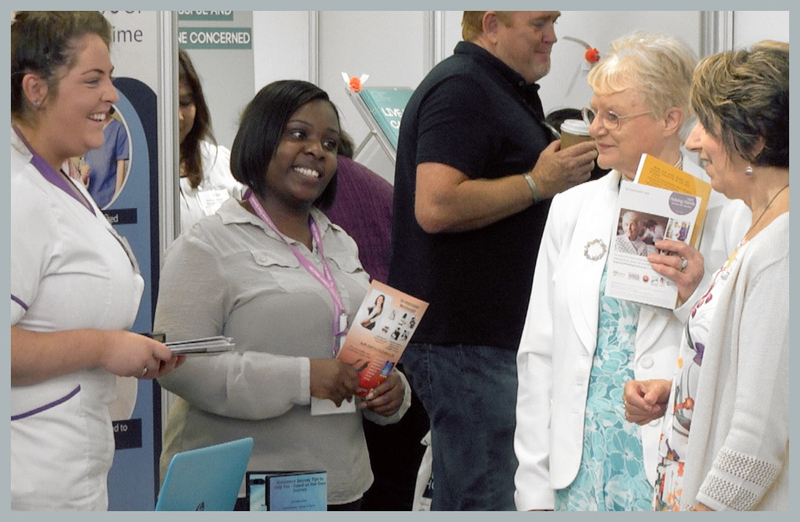 I made sure I got around every exhibitor over the course of my being there, stopping to chat with people on various care-related stands – including receiving some valuable advice from professionals on the stands at the various dementia treatment and research organisations. I also loaded up with leaflets and brochures regarding dementia-friendly holidays, specifically-designed products, home care services and much more. It really opened my eyes to the fact that you aren’t just looking at clocks with big numbers on them, there’s a whole range of useful tools and engaging activities that are available for people with Alzheimer’s to benefit from. 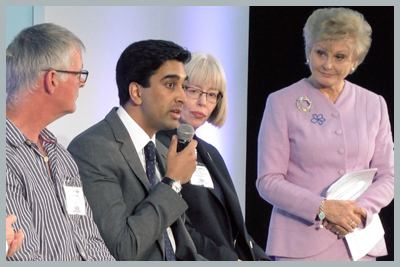 I attended several of the talks in the various seminar areas, including inspiring tales from people living with Alzheimer’s themselves. (My father, like regular Show speaker, Keith Oliver, is a former primary school headteacher – so Keith’s talk about life since his diagnosis was of particular interest). 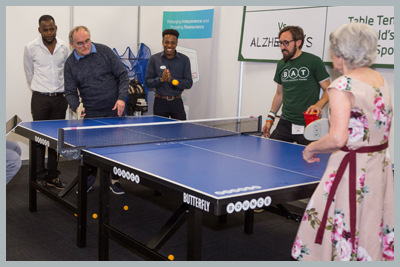 There were also plenty of activities on offer – including table tennis, singalong sessions and even a ‘dementia experience’ that appeared to be very informative for those people I saw taking part. At the end of the day, I felt surprisingly buoyed by the whole event – with an unexpectedly positive reaction that things were not as bleak as I might have imagined. Chatting with the people there was a great reminder that a dementia diagnosis needn’t be as life-changingly final as I’d originally feared. Perhaps most of all I was pleased to have spent the afternoon in the company of people who were going through similar things, and I came away feeling much more positive about the future. I thoroughly recommend attending the Show to anyone. 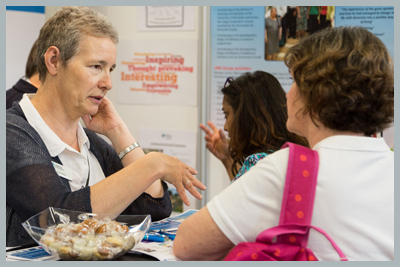 Whether you are in a similar position to myself, are yourself living with dementia, are a carer, are a professional in the industry, are one of the ‘worried well’, or you simply want to find out more about what’s available to assist people living with dementia and those around them.